This has gotta be the coolest house in all of OB. There’s no other house like it. Not along the cliffs like this. It’s at the end of Bermuda Pescadero Street and has been there for decades, in various states of repairs. 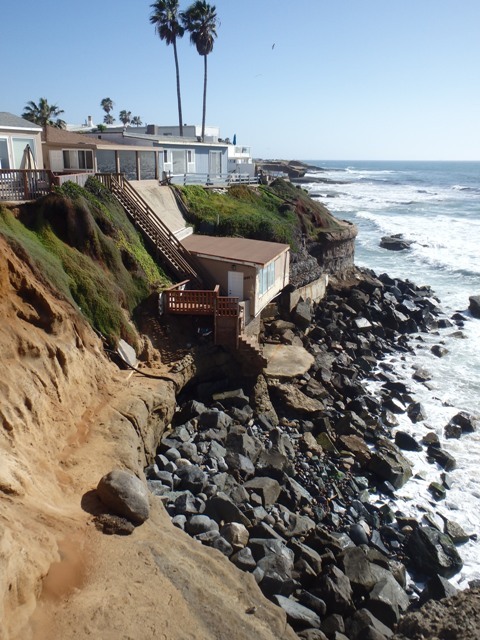 So close to the ocean, this dwelling has to have a very moderate year-round temperature. It has to be the coolest house in OB. What street is that suppose to be on? Sunset Cliffs? Ocean Front St.? It s not on Bermuda. Pescadero – called us on it already and we’ve changed the text. Christo – you are correct! Thanks. I had to refer to my notes that I took over a week ago and it said “Bermuda”. Oh well. There used to be a patio on the top and one below. I have fished from both. Was this structure originally constructed this way? Is it a free standing property or attached to tbe home above? Is that bluff eroding further? “Investigation” – come now, my friend – just trying to share a bit of OB with you plus certainly didn’t want to disturb the residents – nor take the time to look into any history. Great piece to share, thank you. libs never take time to look into any history…..
Cat – that is crazy – the OB Rag is filled to the bream with history. Definitely. There used to be a cement porch below it. Coolest location, perhaps. However, that shack is far from the coolest house in OB. Well, rick callejon – YOU should talk – afterall – you definitely have one of the BEST houses and views in OB! I stumbled across this place years ago while out walking the cliffs (or attempting to) with some friends – when the occupants, along with those in the place above, were having a huge party and welcomed us with a few beers. Thought it was really cool then and I still think it is today – though I doubt it’d be legal nowadays, if it ever was. Unfortunately, I couldn’t figure out at the party who actually lived in the house, or I’d have tried to make friends and asked to check it out…I’ve always wondered if there’s more to it carved into the cliff or something, which would only make it even cooler. Look what the cat dragged in…Poppycock! The address is 1496 1/2 Pescadero Drive….I actually live there for nearly 6 years and yes..we had many, many parties to say the least. I lived there from 1992 – 1998. Orignally when this house was built there were actually 2..one directly below on the slab in front. In the late 80’s the lower “shack” was destroyed in a storm which also took away the toilet for the upper “Shack”. So when I lived there there was no toilet….which for $250 month in rent was just fine! 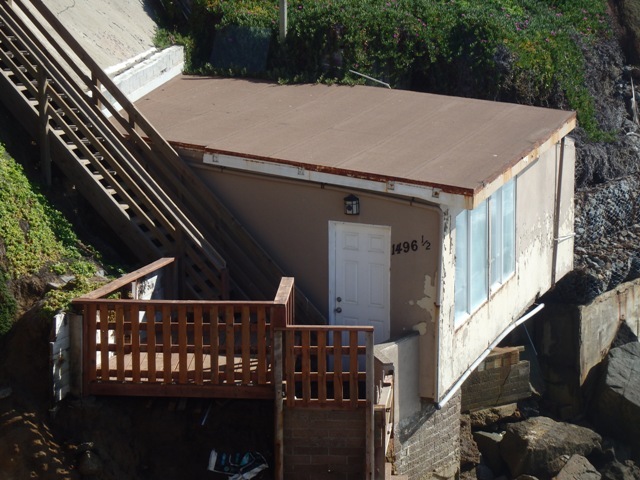 The inside was painted & carpeted and it has a shower, sink, refrigerator, etc….and was the perfect beach house during college. The surf gets big in January and usually beats up the front of the house (you could get some water in the house if the window is open) and the surge can run in front of the door and up the stairs. Sometimes seaweed would end up on the roof…Overall definitely not only the coolest house in OB but one of the coolest on the planet! Newer Article: Is It True that California Only Has One More Year of Water Left?